High in the hills of Kenya's Mau forest, some 20,000 families are facing eviction from their farms - accused of contributing to an ecological disaster which has crippled the country. The authorities are to start the process of removing them any day now. Farmers will be asked to surrender their title deeds for inspection. If their documents are genuine, they have a chance of being resettled or compensated. If not, they will simply be told to go. "We are afraid. Not only me, but all of us here," says Kipkorir Ngeno, a teacher and father of six, from a village known as "Sierra Leone". "They call us squatters - a very bad name. But this is my land. It is not illegal." Mr Ngeno is one of those accused of responsibility for droughts which have left millions of Kenyans thirsty for water and hungry for retribution. Mau forest is Kenya's largest water tower - it stores rain during the wet seasons and pumps it out during the dry months. But during the past 15 years, more than 100,000 hectares - one quarter of the protected forest reserve - have been settled and cleared. 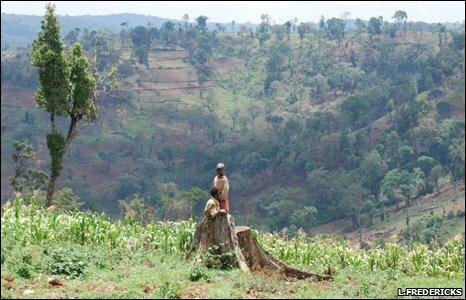 Tearing out the trees at the heart of Kenya has triggered a cascade of drought and despair in the surrounding valleys. The rivers that flow from the forest are drying up. And as they disappear, so too have Kenya's harvests, its cattle farms, its hydro-electricity, its tea industry, its lakes and even its famous wildlife parks. The finger of blame is being pointed at the settlers in Mau. And the solution, according to a special task force appointed by Prime Minister Raila Odinga, is to uproot the invaders and replant the trees. 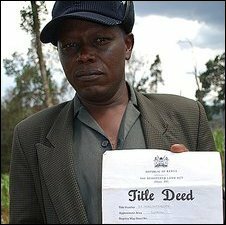 Of 20,000 families living in the forest, they estimate that as few as 1,962 have genuine title deeds. "We must act now - before the entire ecosystem is irreversibly damaged," said Mr Odinga. "We are looking at securing the livelihoods and economies of millions of Africans who directly and indirectly depend on the ecosystem." The prime minister was speaking at the United Nations - appealing for donations of $400m (£250m) to "rehabilitate" Kenya's water supply. If he does not act, he foresees a struggle for water and land which could escalate into a bloody civil conflict. Because in the valleys downstream of Mau forest, farmers like Peter Ole Nkolia are running out of water, cattle, and patience. 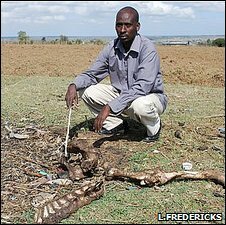 "Those people up there need to just move," says Mr Nkolia, as he stands by the carcass of a dead cow. "If the destruction of Mau shall continue I can assure you that a lot of people will suffer. "What you are going to see here in Narok is just the skeletons of cattle - and maybe people." Worse still, the water from Mau quenches thirst far beyond Kenya. Its rivers feed Tanzania's Serengeti and keep the fishermen of Lake Victoria afloat. When you consider that Lake Victoria is the source of the Nile, you begin to grasp the scale of the crisis the Kenyan government is facing. "This is no longer a Kenyan problem," said Mr Odinga. "Tanzania and Egypt are feeling the heat from the Mau. "And the implications go beyond the environment. This has the potential to create insecurity as people squabble over dwindling resources." Chopping down the tree cover in Mau has removed a natural "pump" which keeps the ecosystem alive. "It rains a lot in Kenya - but only in the rainy seasons. Then you have four long months with not a drop," explains Christian Lambrechts, from the Nairobi-based UN Environment Programme (UNEP). "So you need a buffer zone - a way to ration the rain water and release it slowly into the rivers in the dry season. That buffer is the forest. "If you remove this ecosystem, you reduce the moisture reservoir. Which means that in the dry season... 'Hakuna maji'. No water." When the rains in Kenya stop falling, the 12 rivers which stem from the Mau forest are the lifeline for about 10 million people. And this year in Kenya, the rains failed badly. Narok county - the breadbasket of Kenya - was a barren dustbowl in April, the wettest month of the year. The government declared a "national emergency" with 10 million Kenyans facing starvation. Cattle keeled over and died, in their millions. And as the drought worsened, Kenyan government was forced to bail out farmers by slaughtering their weak animals for just 8,000 shillings ($105; £65) a head. In western Kenya, the tea plantations of James Finlay, which feed on the rivers of western Mau, have seen their yields cut to 80%. And the town of Kericho experienced water rationing for the first time in a generation. Wildlife tourism - another pillar of Kenya's economy - is wilting in the heat. Lake Nakuru, the birdwatcher's paradise, is disappearing. The rivers that feed it have run dry. They come from Mau. And in the Masai Mara, the river which hosts the world famous "crossing of the wildebeest" has fallen to its lowest ever level. Water scarcity has brought wild animals and farmers into conflict. Deaths, injuries and compensation claims are at record highs in Narok, according to the Kenya Wildlife Service (KWS). The fuse for all these disasters was lit in Mau. "The Mau, in a sense, is the hen that lays the golden eggs," says Paul Udoto, of KWS. "The eggs are Lake Nakuru, the Masai Mara, the tea plantations... the farming that is being done by pastoralists. "Once you destroy the centre - the hen - that is the Mau - then by necessity you have to lose the golden eggs." But can deforestation really be to blame for all these catastrophes? After all, there have always been cyclical droughts in Kenya. The trouble is that these droughts are becoming more frequent, more severe and less predictable. Particularly since 2001 - the year when 60,000 hectares of Mau were allocated to settlers and cleared. "At a time when the climate in Kenya is becoming drier, that is when you need to boost your ecosystem - to help it to absorb the impact of climate variability," says Mr Lambrechts. "Go in the opposite direction, and you are going to feel those impacts much bigger. That is what we are currently feeling." 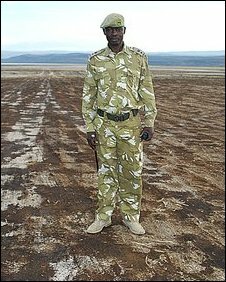 Mr Lambrechts is one of 30 officials recruited to the task force by Prime Minister Odinga. Their report, published in July, set out in painstaking detail how more than 100,000 hectares - one quarter of the entire forest reserve - was parcelled up and cleared for settlement. Almost 20,000 land parcels were "excised" by the governments of Daniel arap Moi and Mwai Kibaki, and handed out to farmers - which helped to boost the two presidents' popularity in the run-up to elections. At the time, much of these excised land parcels were promised to Ogiek peoples, the original forest dwellers. But the title deeds ended up largely in the hands of local officials and incoming settlers. Meanwhile, in the southern Maasai Mau forest, almost 2,000 plots were illegally purchased within the protected forest reserve, with the help of local officials. Plots known as "group ranches" were expanded, subdivided and then sold on to third parties, unaware that their new title deeds may be "irregular" or "bogus". An area of central Mau was "adjudicated" to local people who have traditional rights in the forest. But elsewhere large chunks of the forest were occupied and squatted - "encroached" to use the official terminology - by settlers with no title claim whatsoever. The task force insists that almost all of these settlers and land owners should leave the forest as soon as possible. But how many deserve compensation? This is a political tightrope for Prime Minister Odinga. The task force has promised that each family will have their claim heard on a "case-to-case basis". All holders of "genuine" title deeds will be compensated - perhaps even those high-ranking public officials who are named by the task force as having received land via irregular means. A search for new land to resettle farmers is underway, but is already provoking controversy. "I hope when they go to the World Bank they won't get any money," says Professor Wangari Maathai, the Nobel Laureate and environmental campaigner. "The only reason why we are being held hostage with the Mau is because people who were in power want to be compensated." But perhaps the biggest challenge of all facing Kenya is the ecological one - the co-ordinated replanting of 100,000 hectares of indigenous forest - more than 100 million trees. It will take decades to restore the canopy - years in which Kenyans will continue to suffer from the double-whammy of local land degradation and global climate change. Yet among environmentalists there is some relief that, at last, Kenya has woken up to a disaster that has been brewing for decades. Countless warnings have gone unheeded, as Ms Maathai can testify. "I keep telling people, let us not cut trees irresponsibly... especially the forested mountains," she says. "Because if you destroy the forests, the rivers will stop flowing and the rains will become irregular and the crops will fail and you will die of hunger and starvation. "Now the problem is, people don't make those linkages." In Kenya this year, everyone is making those linkages. I come from the environs of Mau forests. In the 1990s when I was young, there was a land selling frenzy within the neighbourhood in preference for cheap or free forest land in Mau. People used to boast of virgin soils and reliable rains in the Mau and to spice the deal, it was either free or sold at at throw away price. Then, it used to rain a lot in our area. I remember very long rains in April and December of every year. Farming was booming as farmers could know when to plant their crops. These days, it hardly rains. Droughts are the order of the day. The last time I saw the real rains was 1998. Gone are the streams that used to flow down our land, gone is the swamp that we used to hunt birds in my child hood. The Kamwamba dam we used to fish and swim and watch ducks swim is dying. I get sad a lot whenever I visit my rural home. I don't know what our children will inherit if all these continue. Obviously a barren desert! Our people are now poor and starving in a land once so affluent. I get more sad when politicians politicise a purely environmental issue, when the global concern is global warming, they choose to think in terms of the next election. Don't these people read the international press? Even though there will be social consequences when the evictees finally arrive in our village, I think we should consider the greater good! I remember very well the times when most rivers in Kenya were flowing with clean water that was being put to domestic use. But now the case is different what we are seeing is a bomb that is about to blow on our face due to our own actions. For instance the Njoro river which i once had a chance of swimming in when i was a small boy while visiting my grandmother who lives in that area, prompts me to shed tears since what has been left of it a scary part that nobody ever thought of - a dry bed is all that is left for us to see. i take this opportunity to urge my fellow Kenyans to join hands together and preserve our environment. I hope all of us have been taught a lesson for life'. NO one listened to mama Maathai in any way! She fought uhuru park grabbing, warned about the constitution and sucking of ministers in 2005, warned about the shamba system and the Mau. Instead she was voted out of parliament the voice of truth was cast out. We are paying dearly for our mistakes, imagine the Maasai Mara without the Mara river, the waters in Mara river were so low this time an it really affected the spectacular migration of the wildebeest from the Serengeti to Mara, our hippos, crocodiles and other animals will starve. Who will save the Mau? We are committing suicide by allowing this to continue, Its true that nature is very unforgiving. Better for a few to cry or suffer than the whole nation. We must act know not tomorrow. These people have to be moved if the nation is to survive. They cannot have obtained the land legally because forests are protected areas where no human settlement is allowed. Those documents (title deeds) though legitimate, were obtained in a fraudulent manner. They were not supposed to be issued in the first place. Corruption is the order of things here and we are now suffering from its effects. Europeans must become aware of their complicity because the well-financed flower industry that supplies European consumers is helping to drain the bird watching lakes with their expansive Kenyan operations. This ecological double dipping is a terrible legacy for former colonial masters. The drying climate of Kenya is not caused only by the actions of a few thousand settlers. Certainly deforestation cannot help but we must analyze the drought in the context of the ongoing climate change of all of North Africa if not the world. The government of Kenya is doing itself and its citizens a huge disservice by choosing use the settlers as scapegoats for what could be just another side effect of global climate change. Are these settlers also responsible for the decline of the Arctic Sea ice? Or receding glaciers worldwide? Perhaps we'd like to lay the collapse of the Larson ice shelf on their shoulders as well? The people who benefited from the Mau are not the 'squatters' we have to compensate today, they are those who obtained parcels and sold them off. As Wangari Mathai says, we have failed to hold our leaders accountable. We will continue to suffer the effects as long we do not punish the real wrong doers. The Mau crisis is a symptom of our lack of interest in accountability. Those who acquired the land they never should have and sold it off or held on to it should be exposed and forced to pay. Those who benefited should be found and made to pay. Those people living in mau should not be moved - each one of them must plant at least 200 trees in their shambas. They are there because government gave them the title deeds. It is their right. Kenyans should support the government's plan to remove the 20,000 people now settled in the Mau as a matter of urgency. Compensation and other support for the evictees must not be used as a reason not to act. The cost is incomparable to the loss of livelihoods of millions of people that are affected by the deforestation of the Mau. What is important though is the fact that KFS and the government may be persuaded by the timber industry to re-establish monoculture plantations in the Mau. It is my opinion that the entire are should be reforested with indigenous pioneer trees and tropical vegetation that is able to more effectively provide water catchment than exotic monocultures. I think the Government in Kenya has already stolen enough land from the people of Africa. Citizens of that country has the right to live also. If you fly low and slow over Mau Forest you will appreciate that it has been destroyed. Not 'is being' destroyed but 'has been' destroyed. There are still some trees, of course, but the forest ecology has been devastated by Kenyan citizens at vast profit to themselves ... with complicit government approval and connivance. Kenya has destroyed its own water-resource facilities (most disgustingly, for short-term profit) and then complains for lack of water in its aquifers, commonly blaming global warming as the culprit. Global warming may well be causing or contributing to East Africa's drought but the lack of protection from that drought lies within Kenya's own borders and attitudes. Like the rest of us they need to comprehend that, as the saying has it: "Against stupidity the gods themselves contend in vain". We all suffer from out own and our governments' stupidities ... but Kenya's stupidity is quite simply suicidal. Leaders/MPS in Kenya should look deep inside their hearts. Most of them knows that they've used innocent Kenyans to acquire land and also use the political power to still. This is sickening...Its not MAU forest problems but the real inside shady dealings and corruptions in Kenya. I recently visited my rural home (in western Kenya - Kisii) after three month absence. I was surprised that a small stream (river) which runs across the village and which has never dried in my lifetime (42 yrs) was now completely dry. My old parents now have to rely on water delivered from Lake Victoria by tanker and they are lucky because I do the payments - many households and livestock are in pathetic state. 19 years ago I was the Water Resources Specialist on an environmental study of the Mau Forest funded by the UK government. It did not need rocket science to predict that further forest conversion would cause negative impacts on regional hydrology. The study made numerous management recommendations including excision of degraded forest to settle the Ogiek, forest regeneration, and improved forest and land use and titling governance. Perhaps it's time to dust off this and other reports, and to recollect that the original designation of the Mau forests were as watershed protection forests. This is not just a Mau Forest issue, this is a countrywide issue, damage is being done to 'all' major water catchment areas in this water scarce country, not a single one is intact. Some forests have had to be entirely fenced to prevent logging. In Nairobi city itself - three major indegenous forests have been corruptly degazetted and destroyed (wangari mathaai was assaulted by police trying to defend one of these forests two decades ago) Furthermore, 'Downstream' activities all over the country, in drylands and wetlands, such as sand harvesting and open pit mining are wreaking incalculable damage to the environment. This is a problem that may take a century to solve if we start today. We have no choice but to do so. I come from nyeri and stream that have been flowing from the aberdares since time immemorial are drying up. govt should rehabilitate all forests in kenya not only mau. people should also be made aware of the effects of wanton destruction of forest. a mandatory stiff sentence put in place for anyone caught doing it. The de-forestation of Kenya is an ecological time-bomb. 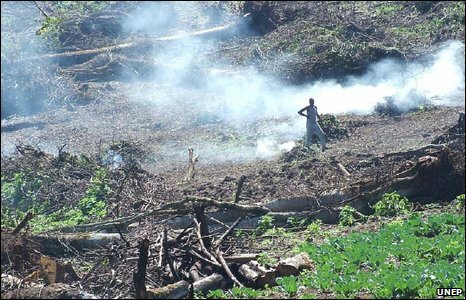 Indigenous hardwood forest all across the country is being destroyed by illegal charcoal burners. But even more shocking is the fact that the thousands of tons of charcoal is not for the domestic market. It is being exported for profit. This illegal industry is robbing millions of Kenyans of their future. Scapegoating subsistence farmers is perhaps a useful smokescreen. We are feeling the heat here, temperatures have been raising. I live in a middle income neighbourhood and there is no water in our houses because the levels of the water in our dams are so low. We are experiencing electricity rationing. We are just in the middle of hot and dry stuff. All these have been traced to Mau. We need help in this country, environmental issues have been politicised and people are confused whom to listen. Kenya is hanging at the cliff of environmental disaster. I have been buying water since the beginning of this year. I have three children the therefore I purchase 300 litres per day amounting to Kshs 100 every day. I have a small garden whereby I use to plant vegetables. We have gone without rain for almost the whole of this year. We do not have electricity since we are having power rationing. Those people who are destroying Mau forest should know that not only are they destroying their livelihoods but also they are putting the future of millions of people who depend on the water tower downstream at stake. Desertification is a problem throughout the continent. Lawlessness allows ignorant people to cut down trees to sell the wood for next to nothing. In just one year time they feel that the weather in their town is dryer and hotter, but they fail to make the connection. God protect the Kenyan government and allow them to save the forest, and the lives of millions of Kenyans. The impact of climate change is grating every common man's nerves here in Kenya. Water is scarce, animals are dying, the land is bare, food prices are scratching the roof, temperatures are high, power is rationed... But every cloud has a silver lining: today I planted six trees and I am leaving my two decade career as a baker, having dedicated the next two to full time conservation.